"The most important thing is to transform the piano from a percussive instrument into a singing instrument .... a singing tone is made up of shadows and colors and contrast ..."
Hurstwood Farm Pianos are proud to be certificated dealers for these fine pianos. Steingraeber pioneering design and superb quality since 1852 have been legendary in Continental Europe. Perhaps because with 100% hand crafting production cannot be hurried, hitherto the make has been less well known to the British public. Now, for the first time, the full range from Steingraeber & Sohne can be seen and played at Hurstwood Farm. 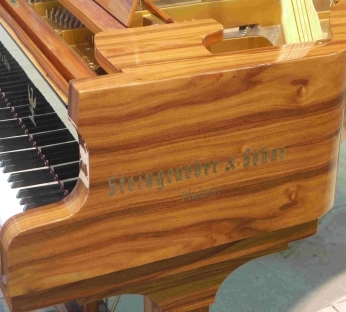 Udo Schmidt-Steingraeber is the fifth generation of the Steingraeber family since 1852 to manufacture these hand crafted pianos in Bayreuth. He and his family live over the original factory where he has studied the craft since the age of 10. Armed with such intimate experience, his Company has confidence and expertise to manage a programme of continuous development. The difference in piano performance is startling and speaks for itself. Alongside Bosendorfer, Steingraeber take its place in the Hurstwood Farm Concert Hall.